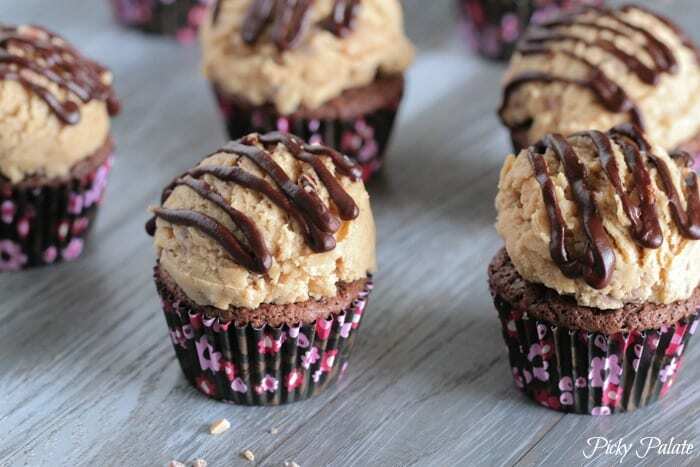 My Homemade Chocolate Cupcakes with Peanut Butter Toffee Chip Dough Frosting are the perfect cupcake to celebrate any day of the week! I have no words to describe my newest cupcake. They are all of my favorite things rolled into one amazing cupcake. Double chocolate, soft perfect cupcake with a giant mound of egg-less peanut butter cookie dough frosting with toffee chips throughout. I’m in heaven! These would make the perfect Valentine’s Day treat for your sweetie pie if I might say so myself. 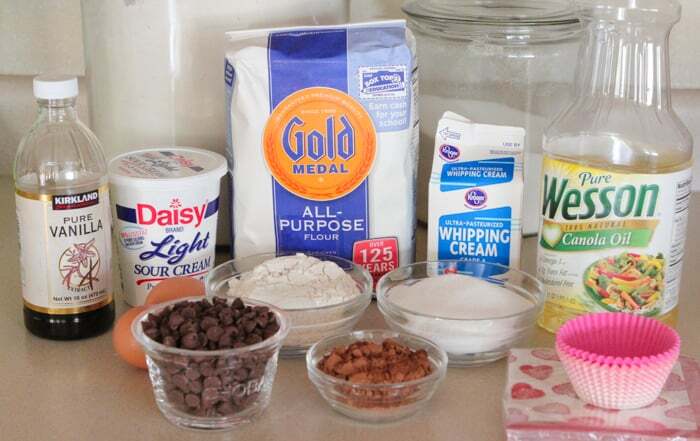 Here’s your line-up of ingredients for your cupcakes. Simple pantry ingredients you are likely to have on hand. 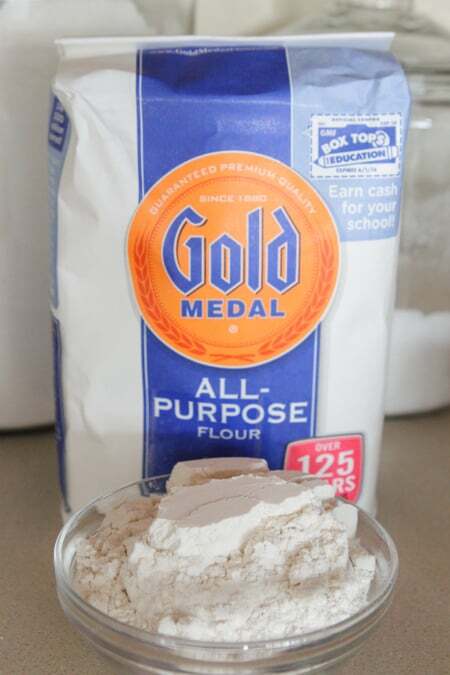 It’s always a pleasure teaming up with Gold Medal Flour. Always a must in my kitchen! You’ll just need one bowl for the cupcakes. Could not be more simple. Fill your cupcake liners 3/4 full with the batter. I recommend using foil liners. These paper liners are not my favorite. I find that when I use some paper liners, I have to use 2 liners per cupcake and sometimes it’s hard to peel them off of the cupcake. 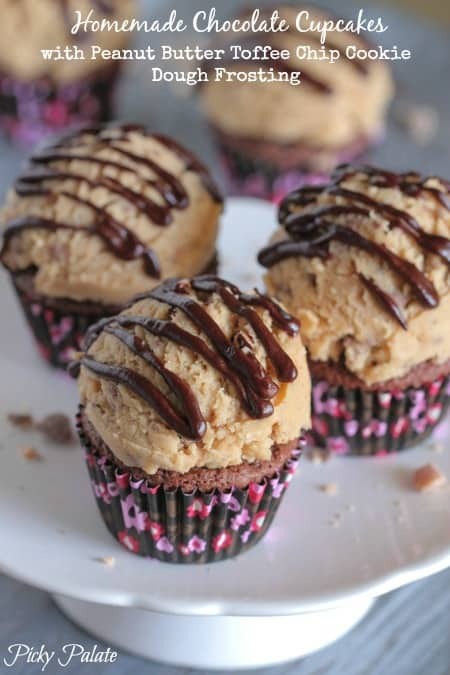 Peanut Butter Toffee Chip Cookie Dough Frosting. Gulp!! I used a big cookie scoop/ice cream scoop for the frosting. Kind of love how that looks! I drizzled the cupcakes with a warm chocolate ganache because you can never have too much chocolate! Enjoy! Another Picky Palate cookie dough cupcake from 2012. A recent Picky Palate chocolate and pumpkin cupcake from 2013. 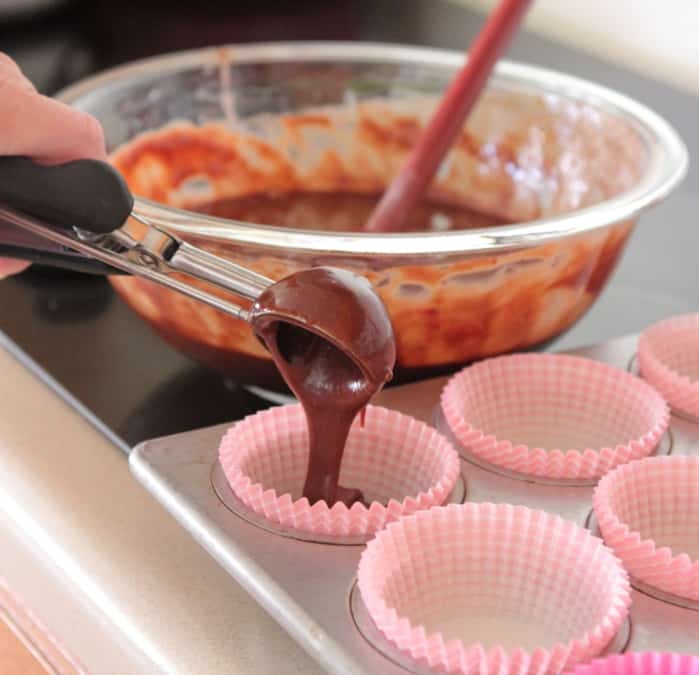 Preheat oven to 350 degrees F. and line 16 cupcake cups with foil liners. Microwave milk in a medium bowl until hot. Pour in chocolate chips and let sit for a couple minutes. Stir until melted and smooth. 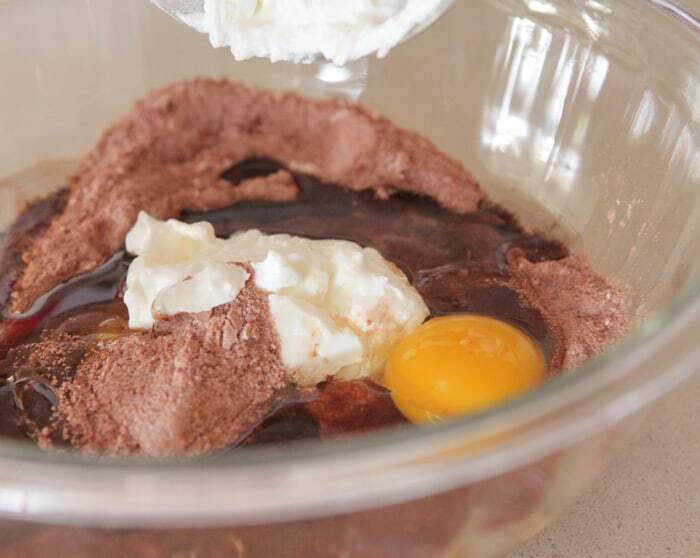 Place flour, cocoa powder, sugar, salt, baking soda, eggs, sour cream and oil into a large mixing bowl. Mix until well combined. Pour in melted chocolate, mixing until well combined. Fill lined muffin cups 3/4 full with batter and bake for 20-25 minutes, until baked through. Careful to not take out early, or cupcakes will sink in the middle. Let cool completely. To prepare frosting, place butter into a stand mixer and beat until smooth. 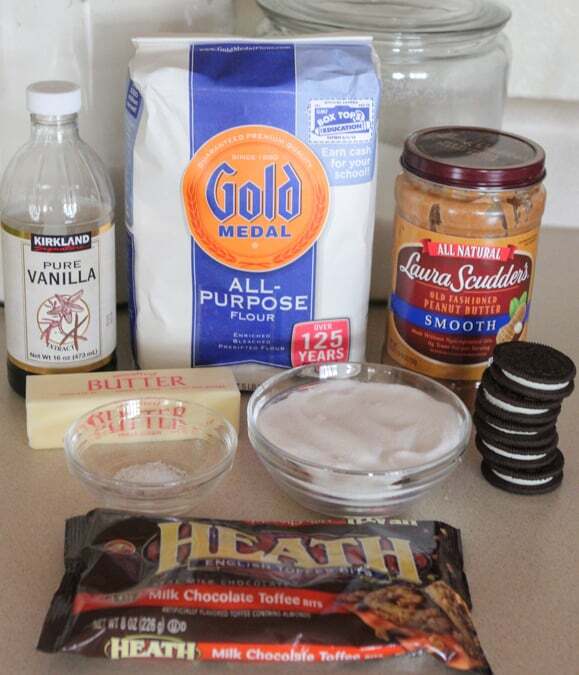 Add peanut butter, sugar and vanilla beating until combined. Add flour, salt, heavy cream and toffee chips, mixing until desired consistency. If dough is too dry, add additional cream. Place dollops of cookie dough frosting on top of cooled cupcakes using a large cookie scoop or large ice cream scoop. Drizzle with warm chocolate ganache if desired. This was a sponsored post for Gold Medal Flour, 2014 however thoughts and opinions are my own. I woke yo find this beauty on my screen pb cookie dough frosting is one thing, but to add toffee bits in aswell. Cant get any better than that! So all the sugar in the cupcakes come from the chocolate chips? I need to try this! Oh my GOSH!!! Jenny! YUM!!! I’m trying to figure out a way to have this for breakfast. Wish I could bring you a plate today!! Happy Birthday girl!! Yum! Cookie dough is the best. What a great way to frost a cupcake! That scoop of frosting is INSANE! I’m going to have to make these for the boys.. they will go crazy for them! Yah, I keep trying to keep my boys out of them! They find a way, lol!! These look awesome! But I don’t see how much peanut butter to use? No problem, I want to make them for my daughter when she comes home from college for spring break….she is going LOVE them! Thanks for the recipe! Incredible!!! I’m in love with the cookie dough frosting. Woah! I love that photo of you and your mom, so sweet!! And these cupcakes!! Oh my gosh!! Amazing Jenny! The chocolate cupcakes and than the scoop of frosting! Holy moly, yum! These are over the top Jenny! Holy Cow Deliciousness! This is one amazing cupcake! Yummy! I want these right now! Totally digging that frosting!! So much goodness! HAVE MERCY!! Can this be breakfast?? Love! I just LOVE that cookie dough frosting!! So irresistible!! So much fun to be in the kitchen with your mom! 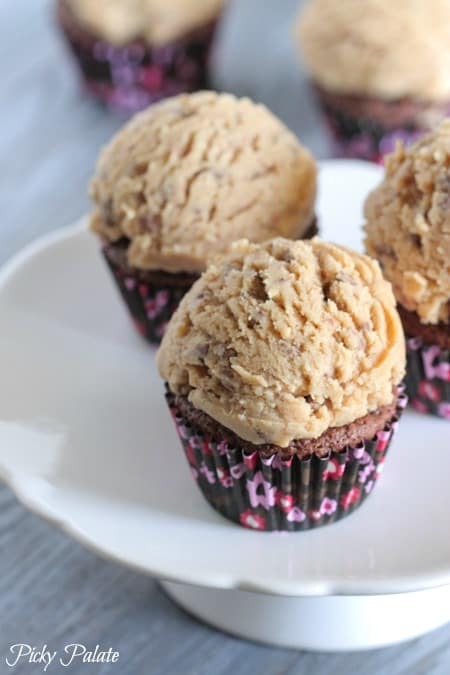 I love these cupcakes, so irresistible with all of that cookie dough frosting!! Helloooo decadence! These are some truly swoon-worthy cupcakes (just the way cupcakes should be!). If only I could source some toffee chips, they don’t seem to be available in Australia. 🙁 We’ve got choc chips and that’s about it. These may be the most amazing cupcakes ever. 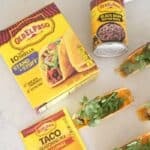 Would it be wrong if I pass up dinner and make a batch of these? I love using my big scoop for frosting cupcakes! Easy and a different style. And of course who can deny peanut butter cookie dough as frosting!? First of all, you are so adorable!! 🙂 And secondly, there is so much deliciousness going on in these cupcakes!! I want one right now!! That photo of you and your mom ————–> ADORABLE!!! And these cupcakes are heavenly! Definitely making these but with gluten-free flour. Off to create my grocery list. Thanks! 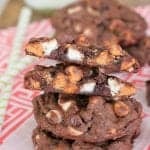 I saw these via A Spicy Perspective (I think she’s out to sabotage my diet, personally, but I forgive her because she’s shared so many delicious and non-sabotage-y recipes as well) and they sound like they are to die for. The reason for my comment is that I was thinking that the cookie dough frosting sounds like THE PERFECT THING to go in homemade ice cream when making cookie dough ice cream. I’ve been on the lookout for just this kind of recipe for using when getting out my ice cream maker. THIS is going to be that recipe! Oh, and be sure I’ll make those cupcakes too, because they look so amazing. Haha! I would totally go for cookie dough ice cream! Great idea 🙂 Have fun!! These cupcakes looks insanely delicious! I made these and they were FABULOUS…so simple to make and so incredibly GOOD! The frosting alone is worth it, but the cupcakes are just as wonderful. These will be made OFTEN! 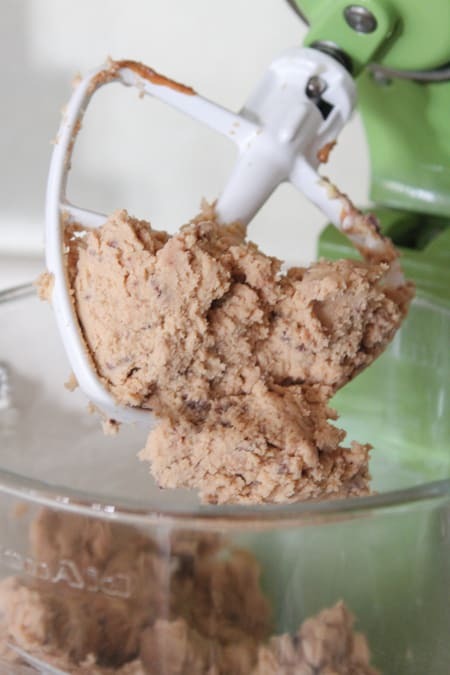 I’ve recently discovered just how good cookie dough icing is but now I’ve seen this one for a peanut butter version I reckon I will be rethinking a few recipes! Oh goodness, I think I love you. I mean that in the least creepiest way possible. Let me rephrase that by saying that my super sweet tooth loves you and all of your scrumptious creations. Since I found your blog several years ago, I can’t help but come back for more, try as I sometimes might! Thank you for sharing! These look absolutely ghastly! There is absolutely NOTHING picky, or refined for that matter of this blogger’s palate! 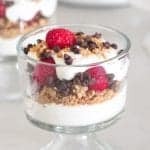 This recipe and the rest of the recipes on this blog where you blindly jam over processed low quality garbage worthy food into each other is Criminal behavior! So Do you and your family all weigh 500 lbs each and are Sick as dogs all the time? Diabetics?